Bamboo Innovator Insight (Issue 63)§ The weekly insight is a teaser into the opportunities – and pitfalls! 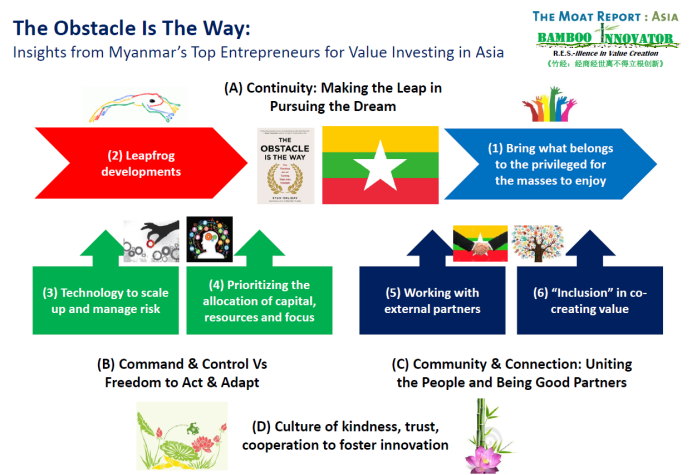 – in the Asian capital jungles.§ Get The Moat Report Asia – a monthly in-depth presentation report of around 30-40 pages covering the business model of the company, why it has a wide moat and why the moat may continue to widen, a special section on “Inside the Leader’s Mind” to understand their thinking process in building up the business, the context – why now (certain corporate or industry events or groundbreaking news), valuations (why it can compound 2-3x in the next 5 years), potential risks and how it is part of the systematic process in the Bamboo Innovator Index of 200+ companies out of 15,000+ in the Asia ex-Japan universe. Abe’s heroic commitment to exposing accounting frauds has been a source of inspiration for us when crafting out Accounting Fraud in Asia, an official course in the Singapore Management University (SMU) degree curriculum that will be launched in January 2015. The course, which is focused on the capital markets perspective, is the first of its kind to be taught in universities in Singapore/Asia and worldwide and is open to all university students worldwide on global exchange programs with SMU. The course is conducted in an interactive session over 15 weeks. 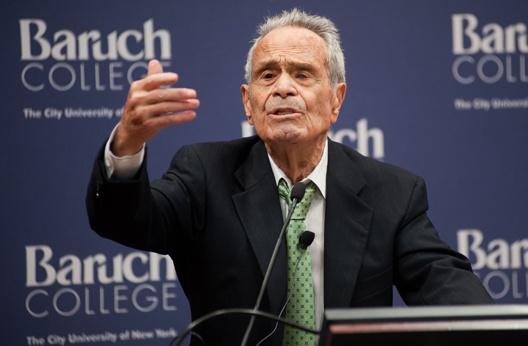 We shall focus on developing an interdisciplinary critical thinking and accounting Perspective with a real-world emphasis in the group and individual project writings, presentation and participation. Perspective has two definitions: (1) Context: A sense of the larger picture of the world, not just what is immediately in front of us; (2) Framing: An individual’s unique way of looking at the world, a way that interprets its events. With Perspective, we can discover leverage we didn’t know we had. 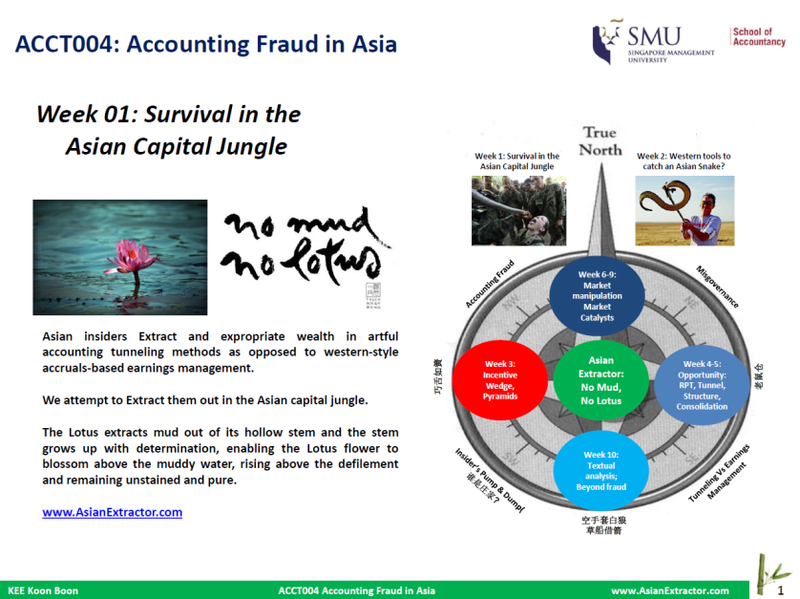 We have also started a simple website called “Asian Extractor: Unearthing Accounting Fraud in the Asian Capital Jungle” (www.AsianExtractor.com). Asian insiders Extract and expropriate wealth in artful accounting tunneling methods as opposed to western-style accruals-based earnings management. We attempt to Extract them out in the Asian capital jungle; akin to the Lotus who extracts mud out of her hollow stem and the stem grows up with determination, enabling the Lotus flower to blossom above the muddy water, rising above the defilement and remaining unstained and pure. AsianExtractor will be a visible global platform for the students to showcase their talent and analysis and to contribute their findings and add value to the global business and investment community, just like Abe and his students. We hope the website will develop into a thought leadership platform on accounting fraud in Asia with analyses and opinions from the students and expert guest speakers in the course as well as from global experts. We are an admirer of the Institute of Design at Stanford in terms of its unique curriculum design as our benchmark and we strive to make improvements over time with your valuable feedback and comments. If you would like to contribute an article to this thought leadership platform on accounting fraud in Asia, please drop us an email at: asianextractor@gmail.com or bambooinnovator@gmail.com. The weblink is the presentation materials for Week 1 (Jan 5-9, 2015) – Survival in the Asian Capital Jungle: Who Knows What When. From Week 2 (Jan 12-16, 2015) onwards, the presentation materials will stand in for the Bamboo Innovator Weekly Insight and be made available for our Moat Report Asia subscribers only. Here’s wishing everyone a Blessed New Year 2015 ahead.